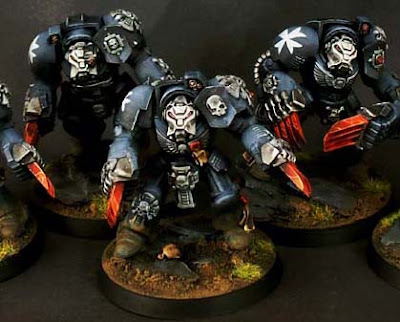 After seeing this Black Templar Terminator Assault squad on samson minis the other week, I decided to share it in this Hobby Focus article. The squad comes from samson minis and I love the blue tint to the black armour. That and it's suitably dark too. All that aside, the real thing I wanted to point out was the saturation in the colors on the models. By saturation, I mean how pure the color is and vibrant. It's not muted by adding white or black or a complimentary color to it to "tone it down" some. The lightning claw blades are almost pure red. The helmet is white, the armour, while dark has a vibrant blue look to it. The dirt is a rich brown color and the grass is vibrant green. Sure the models are dark overall, but the coloring is really saturated and it gives them a very distinct look. Now the flip side of this is to remove some of the purity in a color and mute it a bit. 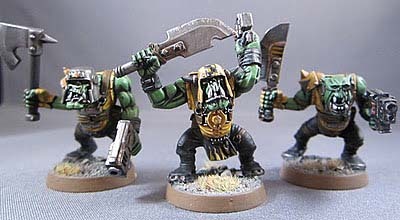 These Bad Moon Orks from Mar's Project Blog are a good example of it. These coloring here is not as saturated, but the effect is no less as good. The green skin is not super pure, but even being desaturated, it reads as a very particular shade of Ork skin. The colors all seem to have a hint of grey to them as well. The high contrast combined with the muted colors gives them a washed out look like their clothes aren't new or repaired regularly... perfect for Orks. That and the basing... it too is muted using greys and browns that aren't really pure in color. It helps with the feeling of the model overall just as the rich colors do on the Templar bases above. It comes down to what you want your particular army to look like. You can take out the purity of your colors or you can make them super rich and vibrant. Both sides of the coin have different effects and can give your army a unique look. I tend to pull some of the saturation out of my colors. I haven't quite mastered the true "muted" look, but I can get it sorted out on occasion. And don't forget, by using both methods on the same model, you can add focus to your models and draw you reader into certain aspects. Yeah, I know this one only too well! I paint almost exclusively in a muted, naturalistic manner which means that when I need to paint something bold and "in your face" - harlequins for example - I really struggle as I am trying to relearn things that I had long forgotten! I'm also a fan of a de-saturated look, which I think is more challenging to pull off convincingly. To stop the overall look becoming 'too' muted I use a complementary 'accent' colour on very small but focal points of the model. Pirate - I also struggle with bright, bold colours, they really jar with me for some reason. That's one of the reasons I've stopped priming in white. It's just too bright! If I only have white primer I tend to bring everything down a couple of notches by washing with a dark colour like devlan mud. I tend to make my models too dark and too saturated...I have real problems pulling of good contrast. It's a fine balance! Pirate Viking: I'm just the opposite, I'm more of a dark, saturated look and really have to work to keep things muted. the unrealistic artist: I agree. I think it's a bit tougher since you can't just go using paints straight from the pot like most of us do I suspect. blacktemplarbob: They are nicely done. Funny, the first thing I thought when I saw the Templars was that their armour was fairly desaturated, but their claws were not. The blue of the armour looks almost like a pastel shade to me. The claws and faces are brighter and more saturated, which really drew my eyes to them. The claws on the terminators look like they've been dunked in lava and have come out red hot. It's a nice effect I think. Could not these differences in colour saturation also be the effect of photography / and colour settings of the image file? I'd like to see both of these units in 'real life' to see what they actually look like ;). SpeedyFrenchy: The blue is a little pale, but it's still fairly pure in color. The claws and base being the bigger, more prominent parts. The Green Farseer: Never thought of that... now that you mention it, I can see what you mean. Isiah: That is true. It could also be partly due to lighting of the model as well and the background color too. I've included them "as is" figuring the individual artists have been able to capture their models as accurately as possible in their photos. I love the way saturation makes models look. I'm a BIG fan of the desaturated, washed out pigments in the Vallejo Model Color line, and I love a muddy, toned down look on a model. That said, those Templars are SMOKIN' HOT!